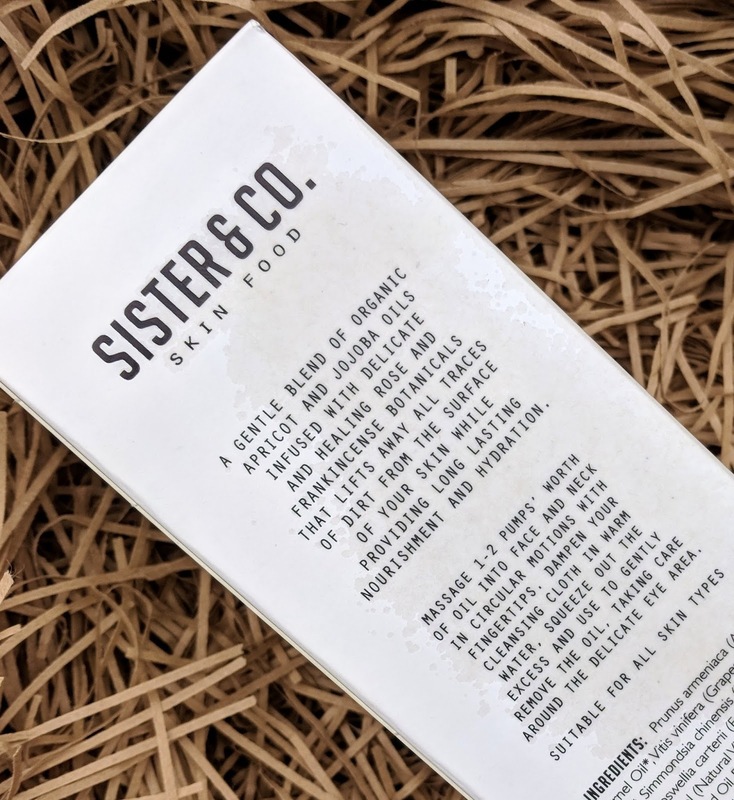 There's something quite special about an oil cleanse and this offering from cult brand Sister & Co Skin Food is no exception. Sister & Co are well known for their 100% natural line of skin, body, hair and oral health products and are hugely popular with green beauty fans in particular. They first grabbed my attention with the release of their Raw Coconut & Activated Charcoal Tooth Whitening Polish and since then I've kept one beady eye on the brand to see what they come up with next. Their newest release is True Cleanse Oil, which, you guessed it, is a rather beautiful cleansing oil. 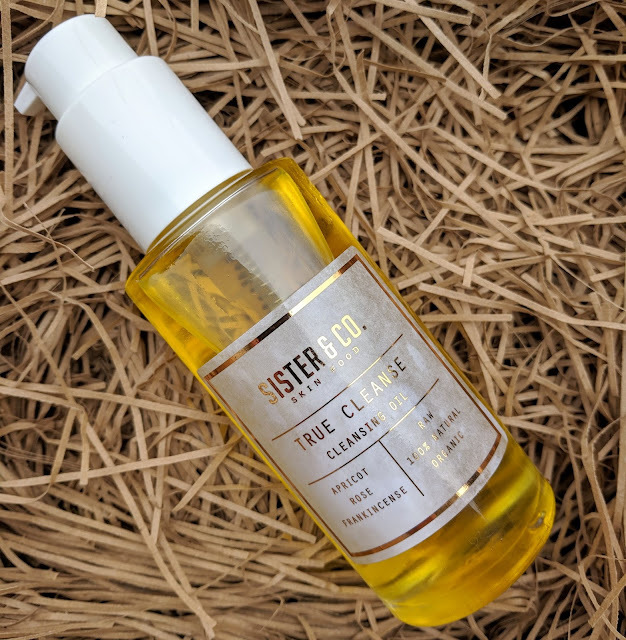 Suitable for all skin types, True Cleanse is a decadent blend of cold pressed organic Jojoba, Apricot and Grapeseed oils and is infused with Rose Otto and Frankincense. The oil has a very delicate scent and is designed to be massaged onto a dry face and then removed with the supplied organic muslin cloth. By cleansing the skin this way, make up and general muck is removed and you get a nice physical exfoliation as well, so it's a two-for-one job really. I don't generally wear a lot of makeup day to day but I recently went out to celebrate my sister's birthday so I did have a full face of slap to remove at the end of the evening. This was a great opportunity to try True Cleanse's make up removing abilities and it did not disappoint. Unlike a lot of cleansing balms and oils, True Cleanse does not emulsify when water is added, so you really do need to use the supplied muslin or a flannel if you prefer, to properly remove the oil. I love oil cleansers and enjoy using ones that rinse away easily just as much as oils like this one, where you need to put a bit of effort in with a damp muslin. I did this using True Cleanse with my full face of makeup and felt a smug sort of satisfaction to see all the remnants of foundation, eyeshadow and highlighter on the muslin cloth. I had been wearing a smudge-proof Bobbi Brown mascara that day and that took a little bit of patience but True Cleanse did remove it, which was pretty great because I don't like faffing with my eye area for too long. And let's be real; a separate eye makeup remover just feels like too much effort sometimes! Swiping over my face with a cotton pad with toner is always a good indicator of how well I've cleaned my face-the less muck on the cotton pad, the better job the cleanser has done. True Cleanse had all but obliterated every bit of makeup as the cotton pad was virtually filth-free. I did go in with a second pump but this oil really did do a brilliant job with just the one go. It's worth noting that the oil comes with a screw cap and is supplied with a pump as well as the aforementioned muslin cloth. Sister and Co only use exceptionally high quality oils and at £30 the price point reflects this. If you like your skincare 'clean' and appreciate natural and organic ingredients, then True Cleanse would be a great addition to your stash. You can find True Cleanse and other Sister & Co products online at Sister & Co, ASOS, Liberty, Fenwick, Selfridges and Anthropologie.